The gods know there is a surfeit of serial killer novels in existence. It is one of the most known tropes of fiction, let alone television, film, etc. How then, to distinguish yourself in the field? Accuracy of detail? Vividness of character depiction? Organic nature of mystery building? A properly disguised surprise or two? Well, yes or no to these questions, they can’t hurt—at least that seems Joe R. Lansdale’s approach in his 2000 The Bottoms. Young Harry Crane lives in the rural bottoms of Depression-era East Texas. His father the local township’s barber and constable, when Harry and his sister Tom discover a mutilated body in the woods late one night, he gets involved. The townsfolk discovering the body is a black woman’s, nobody wants to get involved. The local doctor dismisses the case as none of his business and the sheriff directly states it’s none of anybody’s business, except the blacks’. Harry’s father doing a little poking around in his free time, he inadvertently pokes the hornet’s nest, and more bodies begin appearing. Trouble is, not all are the result of the serial killer. Lansdale does a tricky thing in The Bottoms: he solves a murder mystery through the eyes of a child. Granted, there are a few scenes where Harry is hiding beneath a porch and accidentally hears a conversation or happens to be spying through a window when something significant happens, but by and large the rural life of East Texas and its issues with racism in the early 20th century are fully intergrated into story through his eyes while defining the plot. Another way of putting this is, Lansdale goes a long way toward distinguishing his serial killer story simply by choice of perspective, and good execution of it. 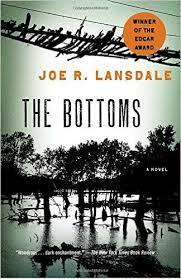 In the end, The Bottoms may very well the best thing Lansdale has written. Racism in the early 20th century American south is probably not the most challenging agenda, but the suffering and injustices described are balanced with a message arches above the direct portrayal of historical reality.. And beyond, it’s just damn good whodunit. The feel for character, flow of plot, and sense of place really pop, coming together to comprise an entertaining, if not eye-opening, read.